Analog Way has been named an official InfoComm International Renewal Unit (RU) Provider. This will allow thousands of professionals who hold InfoComm International’s Certified Technology Specialist credentials to earn renewal units toward their certification by completing Analog Way training programs. Certification Programs for LiveCore series of premium AV video processors, including Ascender, NeXtage and SmartMatriX Ultra units, and Vertige Premium Show Controller, can now be completed for RUs. Both Certified Technology Specialists (CTS) and the specialized designation Design (CTS-D) will get 12 RUs when training for LiveCore and 9 RUs for Vertige. Analog Way has always been committed to helping customers become experts of the brand. 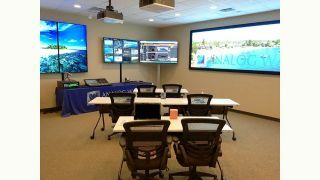 Training AV professionals is part of Analog Way’s main commitment, which resulted in the creation of Analog Way Academy for the Americas a few months ago. “Since its opening this summer, the Academy has already advanced the skill level of more than 50 audio video experts,” said Christina Spurlock, technology instructor. The programs are designed to allow trainees to take full advantage of Analog Way’s systems, no matter what environment they work in. “The benefits of becoming a certified operator are twofold,” Spurlock said. “First, it allows operators to become more esteemed in their career. Secondly, it helps to bring the production they are involved in to a much higher standard. The more the operator knows what to do with the unit in front of him, the higher the production value can be pulled out of the event. Classes are a true opportunity for specialists to exchange with Analog Way teams and get substantial advice on technical points. The class agenda consists of a classroom-based lecture along with equal hands-on and exercise time in separate training rooms. Classes are broken up into blocks, each day consists of certain topics which are then practiced in the equipment rooms with uniquely designed exercises. To gain a wide range of skills using Analog Way products, trainees work with several devices from LiveCore and Midra series, including Ascender 48–4K–PL connected to the Web RCS, the intuitive user interface for the LiveCore platform, Vertige console, and Pulse2 mixer. Through the LiveCore and Vertige Certification programs, Analog Way stands alongside AV professionals to magnify their creativity for a more innovative and richer user experience.